Winners of 2010 sofi Gold Awards Presented at Special Press Tasting | Truly Organic Baking – Organic & Delicious…It's Like No Other! New York, N.Y. (November 16, 2010) – The National Association for the Specialty Food Trade presented the winners of its prestigious sofi Gold Awards at a special fall press tasting at its offices in New York City. 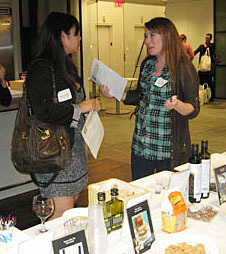 All 33 products were on display at the event, from Outstanding Appetizer, Antipasto, Salsa or Dip to Outstanding Vinegar. A sofi Award is the top honor in the $63 billion specialty food trade. “sofi” means Specialty Outstanding Food Innovation. For a complete list of 2010 sofi Award winners, go to www.foodspring.com/sofiawards. The event, a private tasting, drew journalists with a wide range of interests in specialty food, including writers for Every Day with Rachael Ray Magazine, InStyle Magazine, Weight Watchers Magazine, Working Mother, Good Housekeeping, Epicurious.com, Foodnetwork.com, Huffington Post, New York Times Business Section, Crain’s New York Business, Nation’s Restaurant News, eater.com and Southern Hospitality. This year’s sofi Awards were the most competitive yet, with 2,257 entries from NASFT member companies vying for 33 Gold Awards. The winners were announced at a red carpet ceremony at the Summer Fancy Food Show. 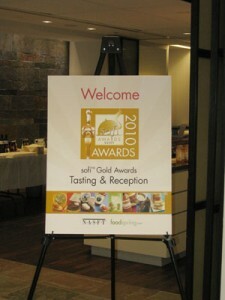 Winners of the 2011 sofi Awards will be announce July 11, 2011 at the Summer Fancy Food Show in Washington, D.C. The NASFT is a not-for-profit trade association established in 1952 to foster commerce and interest in the specialty food industry. Today there are more than 2,900 members in the U.S. and abroad. The NASFT’s website for consumers, www.foodspring.com provides an insider’s look at specialty foods and the companies, entrepreneurs and artisans behind them. For information on the NASFT, go to www.foodspring.com/about/nasft. For information on the NASFT’s Fancy Food Shows, go to www.foodspring.com/about/fancy-food.